Friday night, PWG staged "Dio!," a wrestling event dedicated to the metal singer who recently died. PWG flew in some good outside talent, and featured several people that have not been on PWG shows in a while. (1) Johnny Goodtime & LTP defeated Los Luchas (Phoenix Star & Zokre). A good match with the Luchas working rudo. (2) Brandon Bonham defeated Ryan Taylor with the Hammer of the Gods. A good match, but the crowd seemed to be mellowing. (3) Akira Tozawa beat Scott Lost. Lost was pretty stiff and aggressive, while Tozawa worked a comedy style; his loud screams were very popular with the crowd. (4) The Cutlers & Joey Ryan defeated the Young Bucks (Generation Me in TNA) & Malachi Jackson. The Bucks bullied Malachi during the match. After the match, they brutalized the Cutlers with chairs. (5) Candice LaRue defeated Christina Von Eerie. This was a good women's match, but Von Eerie did not give me a high five; therefore, it was -5 stars. 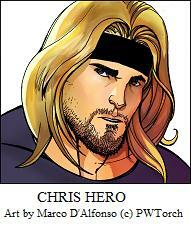 (6) Chris Hero defeated Brandon Gatson. A good, hard hitting match with a very loud crowd that was split on support or hatred of Hero, the former PWG champion. Since PWG champion Davey Richards is in Japan, this was the featured singles match on the show. (7) PWG tag champions Paul London & El Generico defeated Kevin Steen & Brian Kendrick to retain the PWG tag titles. A good, but short match. London and Generico covered Steen in honey, which blinded him, after the match. Steen then accidentally hit a Package Piledriver on Kendrick.